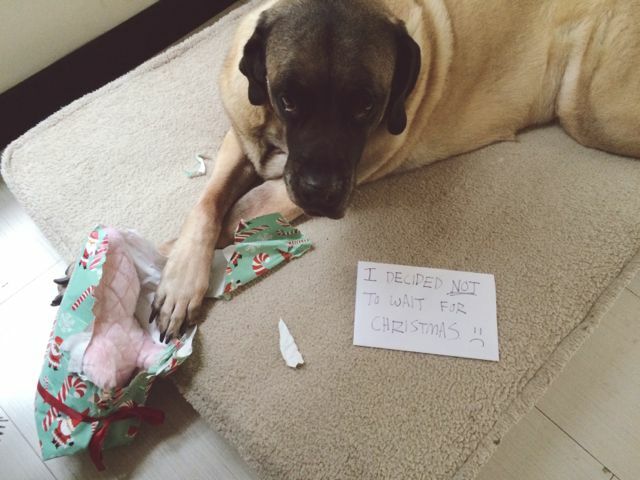 I wrapped his presents and set them on the coffee table temporarily, but he knew they were off limits, and he never messes with stuff behind my back, ever. I'm actually shocked. He'd been whining about them from the minute I walked in the door and set the PetCo bag on the counter. I think pet toy manufacturers infuse everything with some identifying scent, because even if I come home with four Target bags and a single dog toy buried in them somewhere, Chaucer will sniff it out. Anyway, if you think he's pouty in that picture you should see him now, after being scolded and having had the toy taken away. Ridiculous. p.s. Hand to god this is exactly how I found him. No photo styling here. Well, except for the note.